Former U.S. Rep. Zack Space, the Democrat candidate for Ohio auditor, addressed Darke County Democrats on Thursday in Greenville. 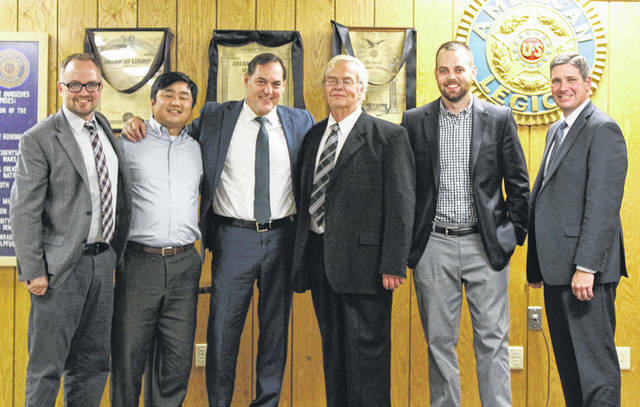 The Darke County Democrats met Thursday at the American Legion in Greenville. On hand were (from left) Ohio House candidate Joseph Monbeck, Ohio Senate candidate Paul Bradley, Ohio auditor candidate Zack Space, Darke County Engineer Jim Surber, Ohio House candidate D.J. Byrnes and Darke County Treasurer Scott Zumbrink. 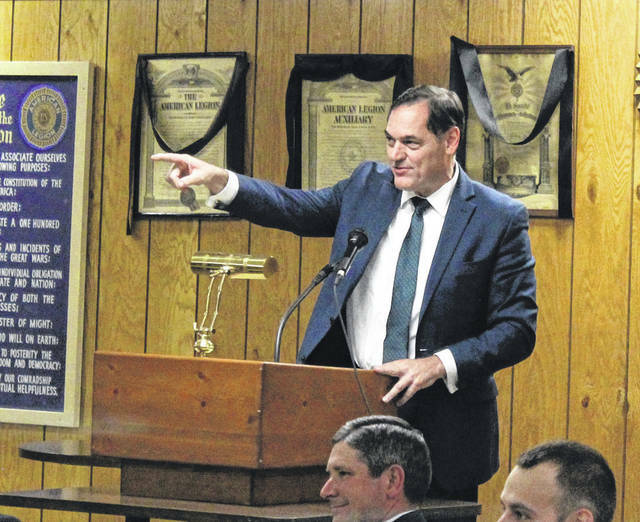 GREENVILLE — A gathering of more than a hundred Democrats came to hear Ohio auditor candidate Zack Space, the keynote speaker at the Darke County Democratic Party’s annual Fall Fest dinner, held Thursday at the Greenville American Legion. Ohio 5th District Senate candidate Paul Bradley, Ohio 84th House candidate Joseph Monbeck, Ohio 80th House District candidate D.J. Byrnes, and Rob Call, representing Sen. Sherrod Brown, also spoke to the gathering, all seeking to inspire Democrats to get out the vote in anticipation of the Nov. 6 midterm election. “And now, here we are, over a hundred years later, after my grandfather emigrated, and I think we have an obligation, all of us, no matter how far back you have to go to find your family’s immigrants, to question this democracy when it begins to stray,” he said. Space also called out Ohio legislators for failing to rein in payday lenders. Space said voters’ lack of confidence in politicians is what led to Donald Trump being elected president in 2016. As well, Space called gerrymandering “the most powerful of political weapons,” noting that Ohio’s congressional districts will be rearranged following the 2020 census and that Ohio’s auditor will be on the state’s redistricting commission. “It’s disenfranchising millions of Ohioans when you have politicians picking voters instead of voters picking politicians. It’s a perversion of the most fundamental element of democracy,” he said, saying it promotes division and political extremism. Finishing, he urged voters to support Ohio’s Democratic candidates. “In the end, as Democrats, this is our guiding principle: the aspiration for social justice — justice in accessing opportunity, justice in accessing healthcare, a quality public education, environmental justice, racial justice, gender justice — all these things that fall within the umbrella of social justice that make us Democrats,” Space said. This entry was tagged American Legion, Darke County Democratic Party, Democrat, Democratic Party, democrats, Fall Fest. Bookmark the permalink.